Free accounts will have no game-play restrictions and can take part in all aspects of the game. Since the business model remains unchanged, Premium status will remain purchasable with either real money or in-game currency for all account types. Ultimately, we believe this step will help us realize our long-term vision or the game. Although we do not have a clear ETA on when the mount skin system will be implemented into Albion or more details on other mounts it at this stage, we do want to give you a heads up on this particular case so that you can make a decision on whether or not you would like to save it, since you will need to be in possession of the mount to obtain the mount skin. More info and clarification on this will follow as we move towards our next major updates. If I started a trial account before the switch to F2P, can I continue to play on it after April 10? Will I get rewards for each game pack I have purchased? The reward will be given per game pack redeemed. I.e. if you have redeemed, say, 3 game packs on a single account, you'd get the reward 3 times. This is to make sure that people who redeemed multiple game packs on the same account - as opposed to different accounts - are not at a disadvantage. Do we need to have premium active in order to receive the rewards for having purchased a founder or starter pack? You do not need premium active on you account to receive the Spectre Wolf, you just need your chosen pack to be redeemed. What are you going to do to prevent bots? The main answer to this of course is Easy Anti Cheat, this is one of the very reasons it was prepared and implemented ahead of the F2P launch. We are not solely relying on easy anti cheat, but in addition we're improving our data collection methods and we're using this data to detect bots as well. Our policy on botting has always been absolute zero tolerance , and several departments in our team are actively monitoring this very closely. What are you going to do to prevent other ways of cheating? In general Easy Anti-Cheat is capable of automatically detecting various cheating methods. In addition to that we are also expanding our support team, who are also keeping a very close eye on this. You can find more information on Easy Anti-Cheat here. What will happen to the gold market? Player market determines the price for premium. If the increased demand causes a price increase, this will make buying gold a more attractive prospect, which should in turn, bring down gold prices. What are you going to do about spammers, trolls & scammers? Automatically censoring racist, homophobic slurs which also applies when creating characters, guilds and alliance names. What are you going to do about silver sellers? Our stance on this remains unchanged, it is and will always be highly prohibited. To combat them we have targeted their business model - how we do that is preventing botting and preventing credit card fraud. We have implemented a system that requires the account to meet certain criteria, which is then manually verified by us to be able to use Gold. I am concerned about players filling zones with F2P accounts, what will you do to prevent this? Please see the answer above in relation to multiple accounts, additionally, the new tutorial also acts as initial time-based barrier that you need to complete in order to access the rest of the game. Right now the tutorial takes approx. 40 mins to complete. And what about naked scouts? Note that naked scouting with a 2nd account is forbidden by our terms and conditions if the same person is inside the dungeon with their first account - that would violate our multi-accounting rules as the two characters are then assisting each other. If you suspect someone of violating the terms and conditions, please report this to our support team here. What about performance & stability? To be clear, improving the technical performance of Albion Online will continually be a high priority to us, and we are fully aware that performance issues sometimes occur during very large fights. 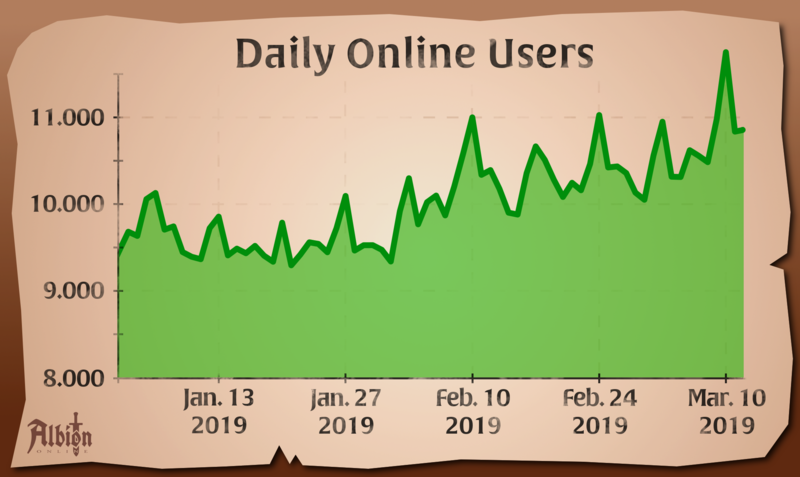 Not only do we strive to push Albion Online to it’s technical limits wherever we can so that you can experience these large scale fights, we incrementally improve the stability of the game as we locate performance issues. Since it can be down to a wide variety of reasons, we are evaluating reports on a constant basis. Adapting cluster caps in relation to performance limitations, while also maintaining our real time action combat model. The Portal Rework should also have an impact on how often you encounter these issues, since the player population will be much more spread out. Naturally, we will be reviewing that during and after the test. We have also invested in additional hardware, to mitigate the impact of server overload of a particular zone on the entire game. We also have several fall-back mechanisms prepared ready for when Albion Online becomes Free to Play on the 10th of April. On top of this, we are always grateful for your support in helping us pinpoint potential issues, it's great if they can forward their cases with as much detail as possible. What are you going to do to make sure that the players who will try out this game will actually stay? We have introduced 6 major updates since release, at a general pace of 3-4 major updates per year which we will keep up going forward. Content is king, and the timely introduction of new content into the game will always have the biggest impact on player retention. During that time, we have made a conscious effort to improve the rewards you can obtain in Albion Online on a daily, weekly and monthly basis. This is also part of our objective to introduce features that let you make meaningful progress and feel the benefits of logging into the game on a daily basis, even if your friends and guildmates are offline, which doesn’t lock you into waiting for others to show up. At the same time, we have kept ‘rewarding the effort of individuals’ at the forefront of our minds when designing the way you achieve the GvG season rewards. Not only can you obtain them at different ranks but you also need a certain amount of guild loyalty. Overall, we see that the recent Adventurer’s Challenge and the GvG season rewards, has had a very positive impact on short term and long term player retention. To further expand on that, as you may have read in the recent Roadmap, we outlined our two main goals, one of which being to ‘’Improve the quality and variety of activities available to players of all experience levels’’. By improving the replay-ability and variety of content that we offer to all experience levels, like we see in the Random Dungeons for example, we can create great incentives for players to return to them. One question - your servers are ready for this? The post was edited 1 time, last by Equartus ( Mar 20th 2019, 10:44am ). Lets prepare to welcome some new players then and not scare them away by ganking to many T2,T3,T4 - be friendly and offer a helping hand ... let them develop until they are grown and come back with gear worth killing them for. It's nice to see game that is finally leaving Early Access and developers are finally fulfilling their promises. Please consider the opportunity to make a reward according to the purchased package. It is not fair to give everyone the same. Well this is pretty BIG news!!! I'm certainly going to be welcoming the influx of new players! The more valuable Starter Packs already got their extra benefits in terms of items and gold, so this is totally fair! Honestly you should have just made a SEPARATE server. A FREE-TO-PLAY server for ppl to start fresh and have the BUY-TO-PLAY server here as legacy server that ppl can still pay RL money to get in ! I expected this move in half a year or so, but if you guys think you re ready we the veteran players will do our best to welcome the new players. As Skitted stated previously everyone should do their best to help the new players find their place in this lovely community. I have no doubts that albion will continue to strife for many more years. The post was edited 2 times, last by Joshuan ( Mar 21st 2019, 7:43am ). If someone really wants new players to enjoy Albion Online you should all do big hunt against red zone gankers after release. I hope they took some serious measures against Gold Bots before deciding on this. This could also be a April Fools Joke but doesn't seem like it. great roadmap, regular updates and hearing smart player's feedback is the greatest respect to those, who bought the game. While I'm happy with the bonus rewards the current pay-to-play players will be getting, one thing I would REALLY like is a unique Avatar Border, that sets us apart from the F2P players. I'm thinking of a border similar in presence to the ones that the Legendary and Epic Founders got. 3 Days of Free premium and a reworked skin Direwolf, for being a client for the last 5 years?!! SBI please rethink it twice and give something UNIQUE to the people who have been here since the beginning, the avatar border would be a good start, but something more along the lines as the statue for the Legendary Explorer or something big that sticks out and says a big THANK YOU, maybe gives free 5-10LP a day or something (Has to be clickable), not game breaking and only available 1 per account. The post was edited 1 time, last by Drake_IronHeart ( Mar 20th 2019, 3:47pm ). Be quick, I've a business to run !